Channel 1 poll finds that Lapid's party would win 27 seats if elections were held today. Likud down to 23, Shas barely passes the threshold. MK Yair Lapid's Yesh Atid party remains on the rise and would win 27 seats if elections were held today, compared to 11 in the current Knesset, a new poll released Saturday found. The Netanyahu-led Likud would drop to 23 seats compared to 30 in the current Knesset, according to the Geocartography Institute poll conducted for Channel 1 News. The Arab Joint List has 13 seats, the Jewish Home led by Naftali Bennett would rise from 8 seats in the current Knesset to 11 seats. The Zionist Union, headed by Yitzhak Herzog, crashes from 24 seats in the current Knesset to just 11 seats. United Torah Judaism rises from 6 seats to 9 seats, the poll found, as does Yisrael Beytenu, led by Avigdor Liberman. Meretz, the poll found, would rise from 5 to 7 seats, while Moshe Kahlon's Kulanu drops from 10 seats today to 6. 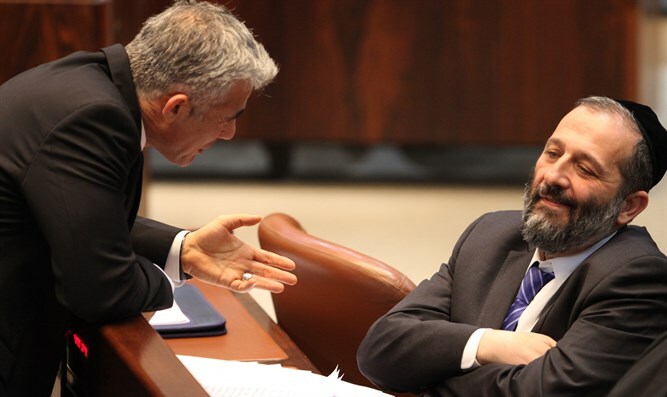 Shas records a decline of 7 seats in the current Knesset to only four, on the limit of the electoral threshold. Yesh Atid's continued success in polls was reflected in a poll released early last week by Channel 2 News, and which found that if elections would take place today, Yesh Atid would lead with 24 seats while the Likud would come in second place with just 22 seats. Likud members, however, were unfazed by the poll, saying, "The Likud voters will come back when they realize that Lapid is a left-winger heading a left-wing party who will promote concessions and withdrawals which will endanger Israel's security - something that Likud leader Netanyahu will never do."